X. Pang, R. Janisch, A. Hartmaier. 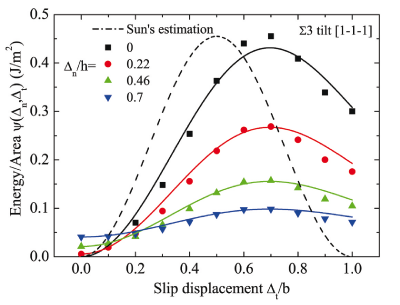 Energy barrier for shear displacements of the Σ3(112) STGB in Al. Super-imposed tensile displacements lead to a flattening and a shift of the energy barrier, the so-called tension-softening effect. Symbols represent DFT data, lines the potential that is developed in the publication. Figure reprinted from MSMSE 24, 015007 (2016) under the terms of the Creative Commons Attribution 3.0 licence. Based on ab initio density functional theory (DFT) calculations we derive an analytical expression for the interplanar potential of grain boundaries and single crystals as a function of coupled tensile and shear displacements. This energy function captures even details of the grain boundary behaviour, such as the tension-softening of the shear instability of aluminium grain boundaries, with good accuracy. The good agreement between the analytical model and the DFT calculations is achieved by introducing two new characteristic parameters, namely the position of the generalised unstable stacking fault with respect to the stable stacking fault, and the ratio of stable and unstable generalised stacking fault energies. One of the potentials’ parameters also serves as a criterion to judge if a grain boundary deforms via crack propagation or dislocation nucleation. We suggest this potential function for application in continuum models, where constitutive relationships for grain boundaries need to be derived from a sound physical model.